EASILY carry goods with this used U.S. Mil. System with Pouches. You get the whole kit and caboodle! Veteran System is all U.S. Mil.-issue and ready to haul. Set weighs 3 1/2 lbs. Condition: used, in very good to excellent shape. Make your move now! Please Note: This item may come in Woodland Camo or O.D., Sorry no choice. Used U.S. Mil. System with Pouches is rated 4.0 out of 5 by 28. Rated 3 out of 5 by penndy from Meh good enough Only issue is that the items were not as described. There was only 1 magazine pouch. There was a lensatic compass pouch that was attached to the shoulder strap. Maybe that was the 2nd magazine pouch? If you purchase this, be ready to buy more accessories for the belt.Item did come in fair condition and is likely to have many years left in it. Rated 4 out of 5 by JReb from Decent smelly stuff Great condition, few rips or tears, buttpack does have a significant stench. Did also only receive one magazine pouch but did get a compass pouch I wasn’t expecting. Rated 4 out of 5 by DarylBruce from Looks and functions as it should But...... Looks and functions as it should. I was disappointed that it came with only one magazine pouch . Rated 4 out of 5 by Jollyginger from Missing Pouch Items were in good condition. No wet poncho, or other bad smell. Satisfied with condition except one ammo pouch is missing, and that's a big deal to me when it's advertised with two pouches. 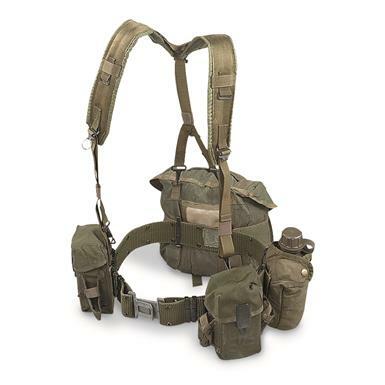 Rated 3 out of 5 by historystudy from missing pouch late vietnam war, missing one of the m14 pouches as shown in photo. Measures 6" x 3.5" x .25"